At this very moment, as I write this, I’am watching you play lovingly with your toys; in fact you are under the coffee table with your bunny, bowling ball, and blanky- and it’s melting my heart. At two years of age, here you are with no worry, just filled with purity, love, and innocence. You know my son, our time on this earth is unknown, for our time of death is only known by God. I may be here today watching you with my eyes and my heart, but I might not be here tomorrow to observe the person you become. That’s why I’m writing this letter to you now, for my time on this Earth may not permit me to tell you the contents of this letter in person when you are ready to hear them. I hope you will read this letter one day, not only with your eyes, but with an open heart, similar to the way I’m watching you right now as you play right in front of me. I want you to know that some people have asked me if I’m afraid that you will grow up to be ‘girly’ simply because you have two older sisters. It hurts me when I hear others saying this, and it even angers me at times. Of course, I’m not worried that you play with dolls, and the fact that you do makes me envision your role as a caring and loving father one day, God willing. When you carry a doll around the house and kiss it with great joy, it brings ME joy knowing that one day you might kiss your own child like this one day. Some might even ask why I let you play tea party with your sisters and my answer is because it makes me happy to see you having imaginary tea with your sisters, and perhaps this is a start of a tradition; my only hope is that you will visit your sisters and have tea together for the rest of your lives. And when you offer your imaginary tea to me with your dimpled hands, it gives me hope that one day you will offer your wife a cup of tea when she needs it – when she’s had a long day or when she just wants you to sit with her and listen. My dear son, please know that I won’t expect you to sit around the house while your sisters and I serve you, but I will expect you to do things for yourself. This is not because I don’t love you, but it is because I do love you. You should know how to do housework as our beloved Prophet Muhammad SAW used to help around the house as well. Son, always remember that our Prophet Muhammad SAW is our role model, and we should look up to him, and not follow the common men of today’s society. If I’am not around to teach you to cook and clean, please take it upon yourself to acquire these life skills, as they will come in handy to you in life and your future family. Just imagine your future wife being pleased with you because you know how to make dinner or you have cleaned the stove for her while she was ill! Just image how these simple acts can increase love between a wife and husband! While typical teenage boys of today’s society may value fancy cars and brand name clothes, please know that these hold no true value. Know that life is not about cars and clothes; it’s about faith, compassion and love. Life is about pleasing God, not society and its materialistic demands. And while I want you to do well in school, get a job and obtain enough income for a living; I also want you to strive for the goals in life that will lead you to the ultimate place of happiness. Son, these goals that I refer to are the most difficult goals to reach. During the process of obtaining these goals I speak of, you may want to give up. These are the goals of being an honest person, a loving person, and a trustworthy person. In a world filled with hatred, jealousy, and fraud it is easy to fall into the traps of deception and evil. You might slip once or twice, but please work your way out and lead yourself to the path of righteousness. Pay often, for God is the only one who will help to rescue you! It is God that will guide you, you just have to ask my son and God will deliver! If I’ am not alive when you desire to get married, please look for the most beautiful woman out there to be your wife. No, I don’t mean beautiful as in society’s definition of beauty; I mean beautiful as in a beautiful heart! Do your best not to chase after a woman that matches today’s standard of beauty, but go after the woman who gives beauty through her faith, through her words, through her heart. Son, this is called everlasting beauty and once you observe this beauty through a woman, your heart will let you know that she is the one. And when you marry this beautiful woman treat her with respect. Don’t ever think that being abusive, both verbally and physically, will make you a stronger man, because it won’t – it will make you a weak one! If you live to be a father, please know that your children don’t need your money more than they need YOU. Use your hands to wipe their tears of pain and sorrow, use your fingers to tickle their tummies, use your ears to listen to their every trouble and worry, use your feet to walk with them through life, use your mouth to express words of appreciation and motivation, and use your eyes to see the light in theirs. Be there for them, teach them Deen, strengthen their Imaan, change their diapers, kiss their owies, play pretend with them, listen to their stories, laugh with them, hug them, hold them, wipe their tears – in other words, give them all of YOU! My son, be the man that will not only please your father and I, but be the man that will please God. Always remember, that we love you and I hope you will read this letter whenever you feel lost in this life, when you feel lonely, or if we are not alive and you miss us dearly. wa iyyakum, yaa ukhti. I should learn more about parenting from you. And you’re right about parenting…thanks for sharing with us. Mashallah, this was beautiful and made me cry when I read it. As a mom of a 7 almost 8 year old, I worry about my son and the kind of man he will become. 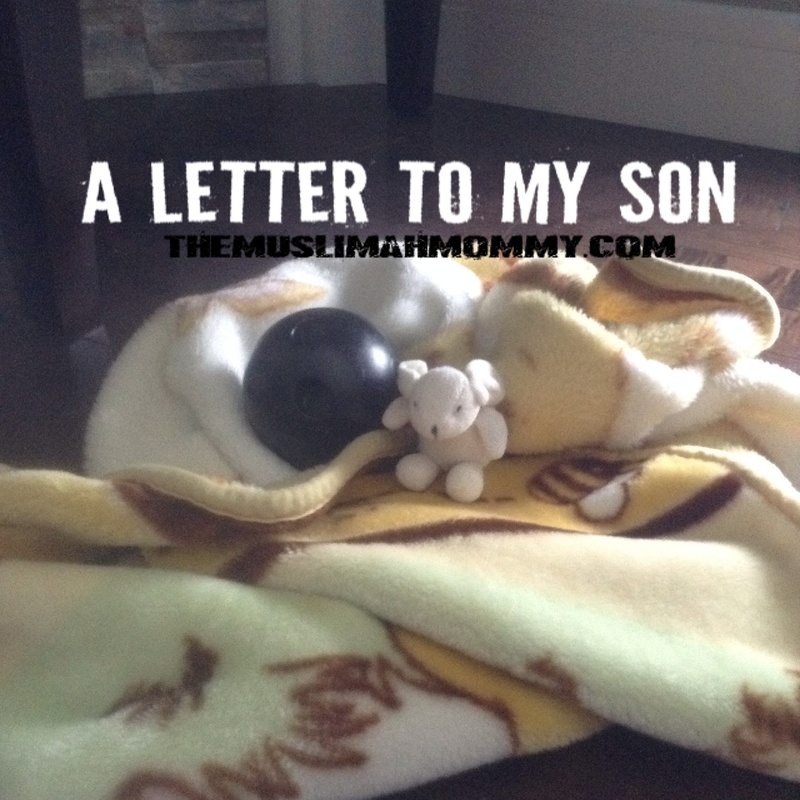 Inshallah, I will have him read this, hopefully he understands that moms only want what’s best for their kids. MashAllah sis very heartfelt letter. As a mother I can understand exactly. I have a son and a daughter too. And you have reminded me we do not know when death will come, and to let it all out now. I pray that all children become good Muslims ameen. Beautiful letter. Been thinking of visiting your blog. Today got the chance. Jazakallah for pouring your heart out in this thought provoking letter.